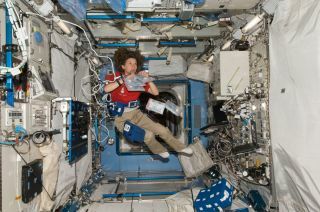 NASA Astronaut Cady Coleman performs tasks in laboratory at the International Space Station as part of the Integrated Cardiovascular investigation – a study evaluating cardiac health in space, including the effect of long-duration spaceflight on heart shape and form. The physiological changes have implications for how manned missions to Mars and other extended trips in space could affect astronauts' health, according to research presented March 29 at a meeting of the American College of Cardiology in Washington, D.C. Predicted change in heart shape at end-diastole on Earth (green) and in microgravity (red). Given these effects, knowing what amount and kind of exercise could keep astronauts healthy will be important for ensuring astronauts remain healthy on long space missions. The same exercise regimens could help people on Earth who have severe physical limitations or heart failure to stay healthy, Thomas said. In the study, Thomas and his team trained 12 astronauts to image their hearts using an ultrasound machine on the International Space Station. Images were taken before, during and after the astronauts' time in space. The images revealed the heart becomes 9.4 percent more spherical in space. Mathematical models predicted the change almost exactly, Thomas said, adding that these models will give doctors a better understanding of heart conditions on Earth. The spherical shape of the heart could mean the heart is functioning less efficiently. The condition appears to be temporary — the astronauts' hearts returned to a normal elongated shape after they return to Earth. Scientists don't know if the change has any long-term effects, however. The researchers are now adapting their models for conditions such as coronary artery disease (the most common type of heart disease and leading cause of death worldwide), hypertrophic cardiomyopathy (thickening of the heart muscle that limits its ability to pump blood) and diseases of the heart valves.